1 oz 2017 Falkland Islands Britannia Reverse Proof Silver Coin | ?? 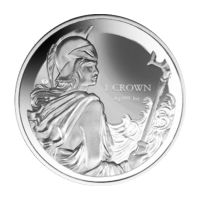 正面 A Pobjoy Mint exclusive portrait of Queen Elizabeth II and the words " Queen Elizabeth II Falkland Islands 2017"
反面 Britannia on guard holding a trident, with powerful waves in the background, and the words "1 Crown Ag 999. 1oz"